Aquinas lived at a critical juncture of western culture when the arrival of the Aristotelian corpus in Latin translation reopened the question of the relation between faith and reason, calling into question the modus vivendi that had obtained for centuries. This crisis flared up just as universities were being founded. Thomas, after early studies at Montecassino, moved on to the University of Naples, where he met members of the new Dominican Order. 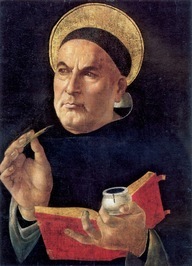 It was at Naples too that Thomas had his first extended contact wit Thomas Aquinas (sometimes styled Thomas of Aquin or Aquino), was a Dominican friar and priest notable as a scholastic theologian and philosopher. He is honored as a saint and "Doctor of the Church" in the Roman Catholic tradition.